Even more than in Los Angeles, shopping in Orange County is a sport that is played in the great halls of retail. Here are the top places to test your competitive shopping skills in Orange County, whether you're looking for a one-of-a-kind designer outfit or a swap meet bargain. South Coast Plaza in Costa Mesa is Orange County's answer to Rodeo Drive, with the highest concentration of high-end luxury retailers in the county and 30 upscale restaurants in two blocks of connected shopping structures. The adjacent block contains the Segerstrom Center for the Arts, the Westin South Coast, and some offices. It's a popular destination for international tourists and is included as a stop on bus tours from Japan and China. Metro Pointe at South Coast extends shopping on the other side of Bear Street, and across Sunflower, there are several discount outlets. 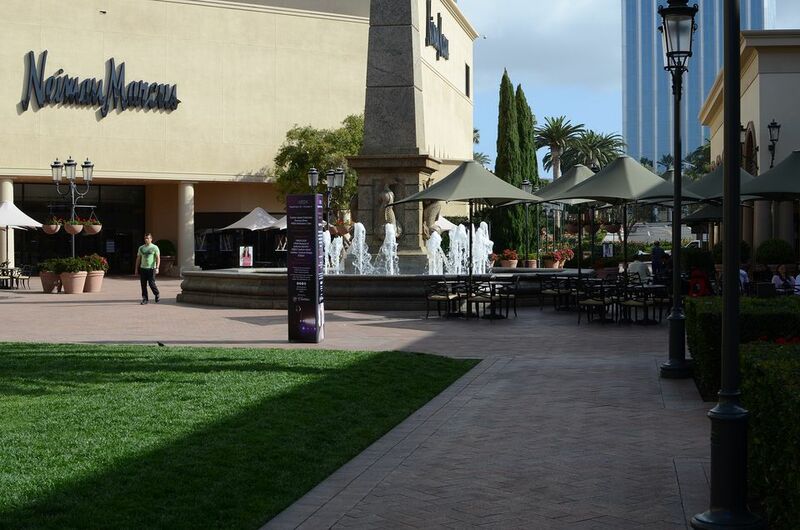 Fashion Island is another shopping center in an outdoor mall with plenty of parking near the coast in Newport Beach. Travelers to the area can get exclusive discounts with the OC Stylish Savings booklet available at the Guest Services Desk. Downtown Disney district is a pedestrian zone of shopping and entertainment that connects Disneyland and Disney California Adventure to the Disneyland Hotels. The shopping mixes major family-friendly brands like Build-a-Bear Workshop and the LEGO Store with exclusive Disney shops like Disney Vault 28, Wonderground Gallery, D-Street, Anna & Elsa's Boutique, and World of Disney, all without having to pay theme park admission. Downtown Disney offers three hours of free parking. The Brea Mall in north Orange County was voted one of Orange County’s best in the OC Register’s annual Best of OC poll. It's more family-friendly than South Coast or Fashion Island. This classic mall has five major department stores as well as specialty shops, such as True Religion, H&M, Michael Kors and Sephora. Bella Terra is a beautiful outdoor shopping center in Huntington Beach that incorporates more budget-friendly retailers and eating establishments along with the high-end offerings. They have a very active calendar of free events including live music and kids' club activities. Irvine Spectrum is another family-friendly mall with an IMAX movie theater, GameStop, Dave & Busters, The Children's Place, Cotton on Kids and lots of typical mall candy and junk food in addition to the typical adult retail offerings. There's a Ferris wheel that operates year-round and in winter, an outdoor ice skating rink. Pacific City in Huntington Beach is the newest shopping development in Orange County with 25 boutiques and shops and several restaurants right on Pacific Coast Highway across from the beach. The Outlets at Orange, formerly The Block, is a Simon Mall, the same company that owns the Brea Mall. It includes Nordstrom Rack, Nieman Marcus Last Call, Saks Fifth Avenue – Off 5th, AnnTaylor Factory Store, Banana Republic Factory Store, Calvin Klein Company Store, DKNY Company Store, Kay Jewelers Outlet, Loft Outlet, Hollister Outlet, Nike Factory Store, Gymboree Outlet, Crocs Outlet and more. It's also known for being the home of Van's Indoor Skate Park. Orange Plaza on the circle in the city of Orange is a roundabout traffic circle at the intersection of Chapman and Glassell in Old town which is lined with antique shops, retro restaurants, and soda shops. It's a great place to discover interesting antique architectural findings and unique furnishings. Recently more modern boutiques have been added, offering more diversity of shopping. SOBECA is an acronym for South on Bristol Entertainment, Culture and Arts. Specifically, it refers to two progressive shopping centers in Costa Mesa that are as granola hipster as you can get in Orange County. The Lab Anti-Mall and The CAMP are on opposite sides of Bristol south of Baker Street. Each one consists of a landscaped urban rustic assemblage of trendy shops and eateries accented with mini-boutiques in strategically placed classic Airstream trailers and public art. The Lab is anchored by Urban Outfitters and the hip second-hand store Buffalo Exchange and is home to the romantic Habana Cuban Bistro. The CAMP is anchored by SEED People's Market, a "green" department store carrying predominantly outdoor apparel and gear the Active Ride Shop, specializing in surf, skate and snow gear and fashion. Native Foods, Old Vine Café, 118 Degrees, and Umami Burger are just a few of the many dining establishments on site. Most people don’t think of a plant nursery as a tourist destination or a shopping mecca, but Roger’s Gardens in Newport’s Corona del Mar is truly exceptional. This award-winning garden sits on seven hilltop acres. The innovative way Roger’s Gardens displays its creative indoor and outdoor living areas draws people looking for design ideas, as well as shoppers looking for everything from holiday decorations to fine art, Italian pottery, and gourmet foods. Every weekend except for four weeks in July and August when the Orange County Fair is on, the Orange County Fairgrounds hosts the Orange County Marketplace, a combination swap meet/flea market with nearly 1000 vendors selling both brand new items and used goods in the Treasure Island section. There is a farmers market, prepared foods to go, and a butcher shop. There's also fair food and holiday entertainment for every holiday as well as kids play areas. Entrance is $2 for anyone over 12. Parking is free. If there's another event going on, tell the parking attendant that you're there for the swap meet.